Not only can vital functions, such as chewing food, be restricted by a tumor, but the deformation of the skull also places an emotional burden on the patients. Depending on the severity of the deformity, those affected withdraw from society and no longer want to go public. However, the clinical picture is not hopeless. An operation can remove the tumor and reconstruct the upper and lower jaw. Such an operation means a restoration of aesthetics and, more importantly, the possibility of regaining some quality of life. Nevertheless, for many patients in Tanzania this solution is a long way off. The country's health system is not able to bear the costs of mandibular reconstruction. As a result, this type of intervention has to be financed by the patient him or herself. This is almost impossible for financially weaker patients. In order to enable them to have the operation and thus restore their quality of life, we have been continuously donating plates and screws to the Muhimbili National Hospital in Dar es Salaam in Tanzania since 2002. The hospital's Oral and Maxillofacial Surgery (OMFS) department is the only one in the country to specialize in this type of maxillofacial reconstruction. To date, more than 50 young tumor patients have been treated with the product donations. In addition, these cases have been reported in publications in recognized journals, such as the International Journal of Oral & Maxillofacial Surgery. This not only improved the lives of the patients, but also promoted scientific work in African clinics. 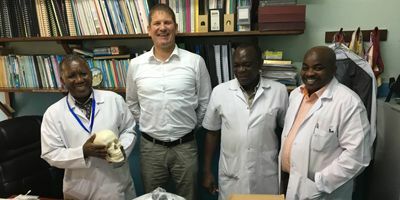 The transfer of the recurring product donations is based on a gentlemen's agreement between Karl Leibinger, President of the KLS Martin Group and Prof. Stoelinga, then chairman of the International Association of Oral and Maxillofacial Surgeons (IAOMS). The IAOMS supports the charity of the KLS Martin Group so that its representatives have already handed over the product donations to the clinics concerned. Within the IAOMS Society there is the Foundation, which endeavors to make donations of all kinds for the education and training of CMF surgeons from all over the world, but especially in disadvantaged countries. Here, too, we are committed and were the first company to support the IAOMS Foundation with donations. Up to this day we are the largest supporter of the Foundation. Over the past five years, we have donated a total of USD 400,000.